A few weeks ago my husband and I were in LA for the Vans Downtown Showndown. Since we were going to be in LA, I googled cupcake stores (on my awesome new phone) so I could treat myself to some cupcakes. I found one--Johnny Cupcakes, and it was only a mile from where we were going. We arrived at the store and I jumped out of the car (since we were in a hurry). I ran into the store and was greeted by the smell of yummy cupcakes. I looked into the glass display cases, but did not see cupcakes...only t-shirts. What?! I asked if they sold cupcakes and the disappointing answer was, "No." I think this is a lame concept. People probably walk into that store all day and are disappointed by the lack of cupcakes. 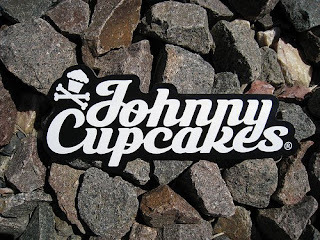 Johnny Cupcakes needs to sell cupcakes, otherwise they are just using the concept of cupcakes to sell clothes. That's the same store I had written to you about this past summer...isn't it disappointing?